I made this project at the request of my friend, Erika. She has three girls who apparently intend to do some trick or treating and need something to contain their sweet stash. Coming from a family of three sisters myself, I'm kind of a sucker for this little group. It's also the first day of October tomorrow, so it seemed the perfect time to tackle something Halloweenish. This bag is small enough to carry, but big enough to hold PLENTY of candy. The tab on the side is for hanging a glow stick or a small flashlight. 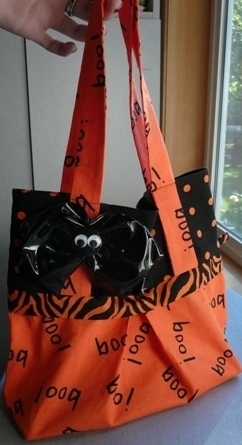 I love this little bag so much, I might have to go trick-or-treating myself just so I can use it. Fold the tab in half, wrong sides together and press. Fold both edges into the center and press again. Stitch close to the edge. Set aside. Fold both handles in half, right sides together. Stitch, turn and press. Set those aside also. Fold the trim in half, wrong sides together, and press. 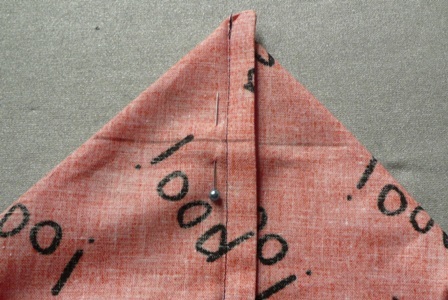 To make the pleats, find the center of the edge of the bag by folding it in half and pressing the top 1/2" of the fold. Fold one side in 1" from the center. Press the top edge. Fold back out 1" from the last fold and press edge. Repeat on the other side of the center. Repeat on the opposite side of the bag. Stitch through both sets of pleats near the edge. Lay out the cuff fabric, right side up. Lay the handle on top, 3" from the edge on both sides. Lay the trim fabric on top of the handle, edge even with the top edge of the cuff. Lay one edge of the bag on top of the trim, top edge even with the top edge of the cuff. Very carefully, roll the bag and handle up until they are more than halfway up the cuff. 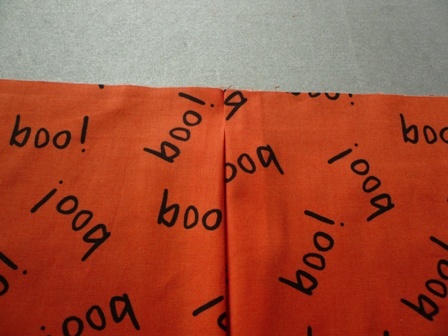 If you've made any pillowcases from my tutorial, this will look familiar. Fold the bottom edge of the cuff over the roll and line up edge at the top. Pin in place, making sure to pin the handles and pleats. Stitch. Reach into one end of the cuff and pull out the bag and handles, turning it right side out as you go. Repeat with the other cuff. This side is a little trickier because you have the first cuff and handles to roll too. Roll it tightly and it should be fine. If you have my excellent measuring and cutting skills, trim the edges of the purse so they're actually even with the cuff. Pin the bag with the wrong sides together. 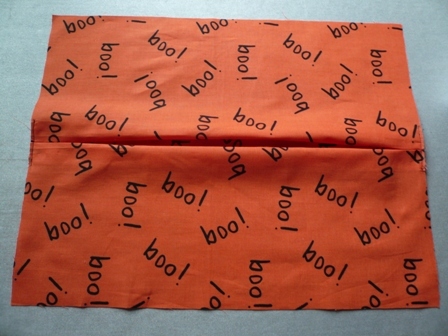 Fold the tab in half and slip it 1/4" into one seam just above the trim. Stitch just under 1/4" from the edge down both sides. Clip corners. Turn wrong side out and press seams. Stitch again, just over 1/4" from the edge. Flatten the corner with the side seam centered. Draw a line 2" from the corner. Pin and stitch along the line. Turn right side out. Press the corners toward the bottom of the bag. Press the handles up. Top stitch near the top of the cuff, through the handles. Cut a piece of cardboard 4 by 10", to fit the bottom. Cover it with fabric if you choose. Come back on Monday and I'll show you how to make the little Button Bat embellishment! If you're looking for an even easier version of this bag, simply cut the bag piece 12 1/2 by 16 1/2", skip the pleats, don't stitch across the corners and leave out the cardboard in the bottom. However, first you have to go tell your little trike-motors that it holds more candy if you add pleats, then come back and tell me which way you went with it.